You had me at “something my wife wouldn’t hate...”! :-) congratulations. Now I see why touring is for sale. Congrats Peter on new daily! White e90 is a sweet looking car, especially with m-sport bumpers. I like factory wheels and would keep them. Are they significantly heavier than APEX ones? Somebody had mentioned typical oil leaks. Do the have the same gaskets problems as e46? if that is the case, I cannot believe BMW did not sort that out. I have a little experience with e90. I drove a 2007 335i ones from Boston to Florida and was amazed how that car performed as a highway cruiser. I drove it on terrible run flats, but even with them car felt great. With new e90 on your driveway, what is the future of X3? Is that your wife's car and you planning to keep it or we should expect another surprise soon? I am will be waiting for some interior pictures and more updates. Now I see why touring is for sale. This is definitely not why the touring is for sale. Well, it's at least a part of it. I thinking he mentioned that he has so many cars and very little time for car projects. Touring was a big project. Let's see what Peter has to say. as far as oil leaks - less, the OFHG can leak, oil pan gasket, and valve cover. all the same leaks as the E46. but totally manageable. as for the X3 - it just got some suspension refreshing, and it doesn't have any glaring issues at the moment, so my wife will keep driving it. considering we're looking at moving in the summer to a more urban area, i likely won't be replacing it, as it's pretty reliable and cheap to own. it was a lot of reasons.... none of them had to do with too many cars, but it was primarily an emotional decision. lots of strife with my wife over this car... and given my current situation, that's just not worth it. had it not been for that, i would 100% be keeping it. and while it's only a car... i can't help but feel a little bit of loss here. and on that note... i am thankful for my wife and kids, and to be alive and breathing. happy 'murican thanksgiving everyone! Thank you sir. Happy moose day to you! Wow, not sure how I missed this! I really need to get on the website via computer more often instead of Tapatalk. Not getting iDrive was definitely the right choice; whenever I drive my dad's '07 5er I'm immediately reminded how worthless outdated tech really is. 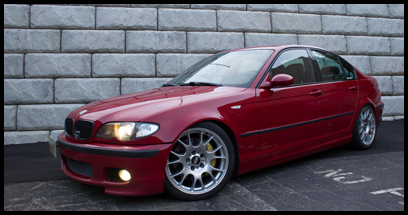 It's actually one of things I find so appealing about the E46 and older. I know they're heavier than what you're used to, but those Style 193s look really sharp against Alpinweiß. yes, the LCI updates really make this car much better looking. the E46 definitely has the edge in the looks department, however in M Sport guise these things have a bit of a mean look to them. and YES to the E91 335i RWD/6MT! after getting used to this thing, having one in Touring form would be killer. i can import one to canada in..... 8 years, LOL (i'd want a 2011 with the N55). no iDrive was just fortunate - this car just happened to not have it, plus be super low-KM and have everything else i wanted. i didn't really care for it in the 2011 335xi's that i drove; the NAV was OK, but a bit cumbersome. so i'm happy to not have it, and it's a lot cleaner inside... i'll post some pics. it's basically like an 'E90 ZHP' inside, with silver textured aluminum trim, anthracite headliner, M Sport wheel and shift knob, etc. yeah, the 193Ms do look nice on there. i'm going to keep them until these tires are dead (they only have about 4K KMs on them.... so it'll be 2-3 years), then likely ditch them for some lightweight wheels (thinking 18x9/18x9.5 apex EC-7's with 235/40/18 and 265/35/18 rubber). that's it. the reason for the last two is that this thing in stock form will spin the tires all the way through 2nd gear if you want, and is a bit twitchy/snappy on oversteer (eLSD isn't awesome), and i would like to be able to put the stock power down predictably. the konis will help generate more grip too.